Welcome to the Pottstown Limerick area. Your morning start with a hot breakfast. 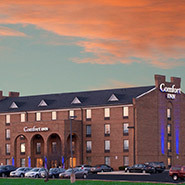 Comfort Inn & Suites Pottstown-Limerick hotel is central to many Pottstown-Limerick area attractions, businesses, shopping, and restaurants. Your morning breakfast is full of hot and delicious options, making breakfast at Comfort Inn & Suites Pottstown - Limerick the perfect way to start your day. All rooms have flat-screen televisions with cable, work desks, refrigerators, microwaves, coffee makers and all the amenities you expect. Whether you're planning a meeting, wedding, banquet, or other special event, choose the Comfort Inn & Suites for a fabulous stay in Pottstown, PA. 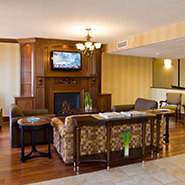 The Comfort Inn & Suites is located just minutes away from some of the Reading and Pottstown area's most popular visitor attractions and historic sites. Looking for a hotel in Pottstown, Pennsylvania? 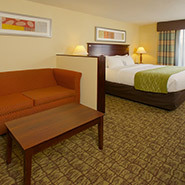 Newly renovated, the Comfort Inn & Suites Pottstown-Limerick was recently voted Pottstown's Best Hotel. We are centrally located near Pottstown attractions such as: Valley Forge National Park, Pottsgrove Manor, Hopewell Furnace, Philadelphia Premium Outlets and King of Prussia Mall. Our Pottstown-Limerick hotel features great amenities like an heated outdoor swimming pool, 24 hour fitness center, business center, free hot breakfast buffet, free high speed internet and a convenient central location located minutes off Route 422, only a short drive to Royerfords, Collegeville, Oaks, and Exton. Relax and enjoy our top of the line room amenities, like free WiFi - high-speed wireless Internet, 32” flat panel televisions i with premium movie and sports channels in HD, microwave and refrigerator, spa showers, and spacious work desks in every guestroom. Our friendly staff, relaxed atmosphere and convenient central location, all make the Comfort Inn & Suites Pottstown-Limerick the right hotel lodging option for your next vacation or business trip in the Pottstown, PA area. "I've stayed in this hotel every week for the last 6 months and it's absolutely the best place in the area for the business traveler. Price-value ratio excellent. Staff always makes me feel welcome..."
Whether you're traveling for a weekend getaway or business trip in Pennsylvania, our hotel specials and vacation packages range from shopping to golf, romantic getaways to dreamy weddings. You're sure to find a package that's right for your needs. Our hotel is conveniently located near the most popular visitor attractions and historic sites in Reading and Pottstown. There's no shortage of things to do near our hotel!